That's a bold strategy there, Cotton. @DMN_George Did you happen to record this sound? If so, could you send it our way? FS1Desk@fox.com. We will courtesy you if used. Thanks! @fishsports do you have audio/video of Lucky Whitehead on his alleged crime from our article you can share with us? Happy to courtesy! Hi all, would FS1 be able to use clips from the Jerry portions for our broadcasts on Monday? We'll be sure to courtesy SB Nation. @MattHayesCFB Matt, we just emailed you. 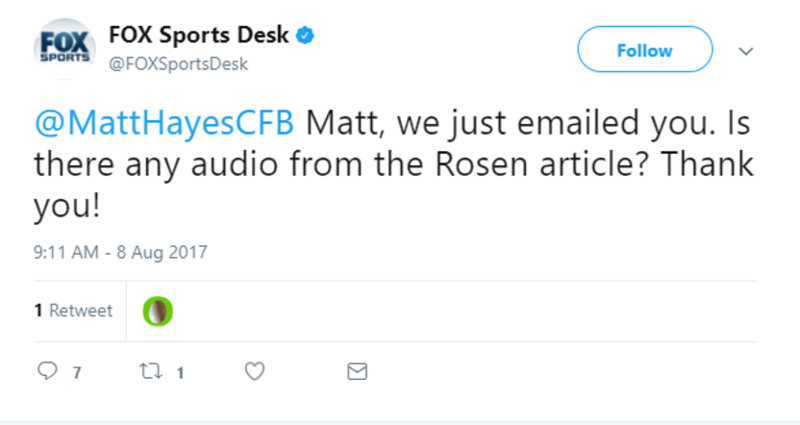 Is there any audio from the Rosen article? Thank you! Hayes is far from the first person to tell a national outlet no on a request, as ESPN’s been dealing with similar denials for a while from both Patriots’ fans angry about their role in Deflategate and hockey writers angry about ESPN’s NHL cuts. The ESPN requests are a little different, though, as they’re usually about permission to use a specific photo or video clip the person in question has posted publicly. That’s the case with some of these Fox ones, which is fair enough; that’s a reasonable request, and people can accept or deny it as they see fit. However, asking for unpublished raw audio that writers have turned into stories is perhaps more problematic. Writers can obviously say yes if they think the added publicity from an on-air or online credit is worth it for them, and some do. But lots are going to say no, and with good reason; this is Fox asking them to do extra work and send in something that hasn’t been posted publicly, and to do so to enrich Fox, which otherwise isn’t able to cover these stories online thanks to their own decision to lay off writers. There have been some cases of reporters and outlets saying they’re fine with Fox using their files with credit, and that’s not unreasonable if they’ve come to the conclusion that the attention is worth the tradeoff. And Fox is welcome to keep pursuing this strategy of asking other reporters for raw files if they think it’s worth it. But, like Hayes, it seems likely there will be plenty telling them where to go. And Fox could have avoided this problem and covered stories online just fine if they still employed some writers. Completely pivoting to video has its downsides.